Foxglove is herbaceous plant that belongs to the plantain family. It originates from Europe , but it is domesticated and widely spread in North America today. 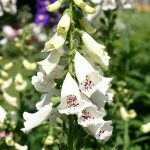 Foxglove grows on slightly acidic soil. It can be found in the open woodlands , on the rocky slopes , sea cliffs , meadows and wastelands. All wallpapers with Foxglove flowers are welcome here. Thank you in advance to those who join and also submit.